Helping others is great in theory, but in practice takes away time that you'd rather spend eating Cheetos and watching Little People Big World, because those specific people don't need your help -- they can do anything average sized people can do! 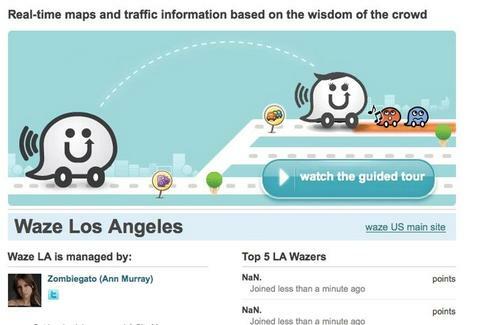 For an app that lets you help others get around just by turning it on, check out Waze. Just launched in LA, Waze's a way-more-nuanced-than-Google-maps-with-Show-Traffic-on free road-condition app that's updated in real-time using GPS data auto-provided by you and all other app users on the road, allowing informed drivers to smartly avoid traffic jams, but not Traffic jams, 'cause "Gimme Some Lovin" still rules. Using it's simple: get in the car, turn that sucker on and leave it on -- while you're driving, it'll track your progress and display slow-spots for others via trailing red lines on a map, as well as inform them of any holdups you may be experiencing, unless you're experiencing an actual holdup, in which case, why the hell are you fiddling with a smartphone app? The only mildly-lazy can inform other drivers about the actual causes of the delays on the road by one-click pinpointing spots on the map and marking them with icons for cruise-obstacles like "well-hidden speed traps", construction work, or the site of accidents, though why anyone's interested in suspicious stains on your carpet's anyone's guess. For the truly kinda-sorta unlazy, they've also got a feature to upload phone-snapped pics of what sorts of buildup/causes you're actually seeing, provided you've got a stool to see over everyone's heads.